A few weeks ago (okay, months) a kind reader contacted me and asked if I had any advice about hosting a literary reading. I wrote back and told her yes, tons, and that I would type it all up and send it to her later that week. Needless to say, I never made good on my promise. This post is my public apology, and (maybe? hopefully?) my redemption! 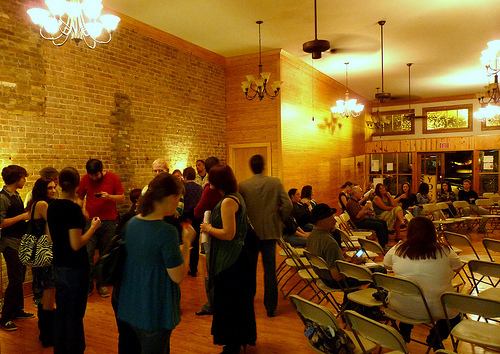 So you want to host a literary reading? Awesome! 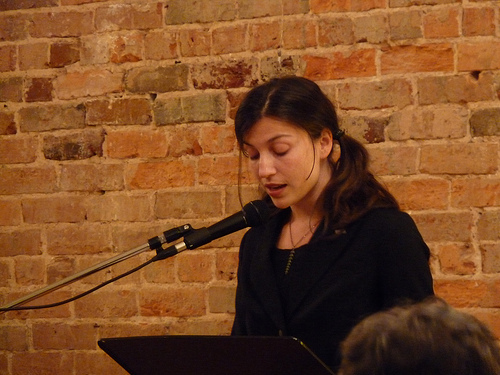 Literary readings are fun and inspiring. They promote a feeling of community, connect writers and readers to one another, and exposure the public to the arts. 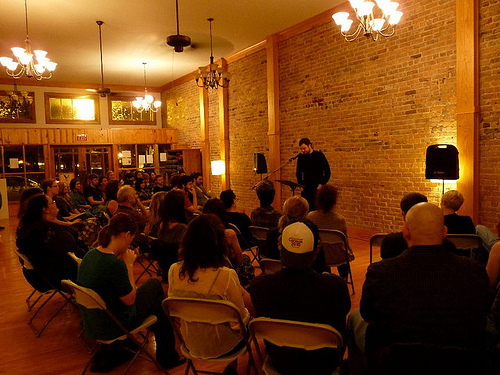 It's not hard to host a successful literary reading, but it does require some planning, some forethought, and a number of small and not-so-small steps. A lot of the details will depend on you - where you live, what resources you have, and who you know. The following tips, however, should be universally applicable. 1. Location! The number one thing you need before you do anything else is a space, preferably a beautiful one. I've been incredibly lucky to have access to Morning Glory Yoga Studios, which is located in the middle of historic downtown Nacogodoches. Because the event is co-hosted by my good friend Amy, and because Amy actually owns the studio, she does not charge me (or herself!) a rental fee. Besides being free, the studio is ideal because it's a big empty space with more than enough room for chairs and mingling, the acoustics are great (though we do use a PA system), and the building sits in a central, easy to find location. 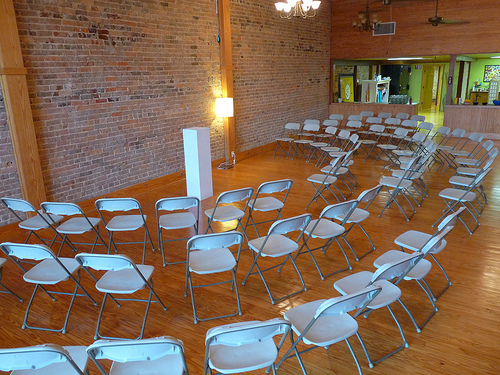 If there's a yoga studio in your town, see if you can hold your event there. If not, you can also look at clubs, restaurants, bars (but choose a slow night) or even community centers and churches. Try to find a place that isn't prohibitive for your audience (a 21 and over bar, for example, would definitely thin the crowd). Because the studio is built for sitting on a yoga mat, we rent chairs from a local place. Since our event is non-profit and we collection donations for the Animal Shelter, and because we're regular customers (bi-monthly! ), we get a slight discount on chairs and coffee cups. 2. Hospitality. 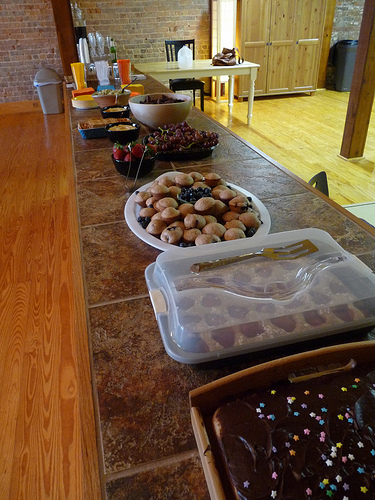 At our events, we like to offer finger foods and drinks - usually coffee or tea. This gives the attendees something to do before the event and during intermission, and it is (in my opinion) plain good manners. Amy and I usually prepare the foods ourselves, and we make an effort to offer healthy and vegan options. This gives us a chance to promote health and compassion (which fits in with the yoga studios' mission) as well as push our Vegan Agenda on unsuspecting souls who are just looking for a cookie. (Kidding. Kind of.) We also purchase air pots of coffee from Java Jacks, a local coffee shop, because a literary reading demands caffeine. One thing we do not regularly offer or encourage at our events is alcohol. Clearly, I have no problem with drinking and we don't mind if someone brings a beer or a flask to quietly enjoy during the performance. But we do have underage attendees, and readings do require a certain amount of concentration. It's just easier to save the drinking until after the show. 3. 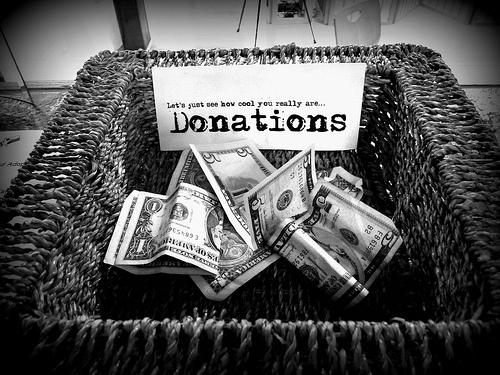 Covers vs. Donations.We don't charge admission to our literary reading series. Instead, we choose to collect donations for our local Animal Shelter. 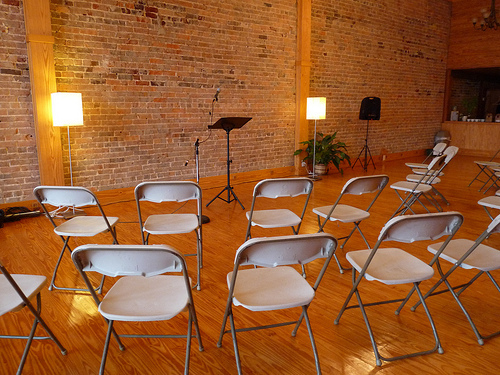 The fact that we use the studio-rent free helps out with this, but make no mistake: Amy and I shell out quite a few bucks for each reading we host. Chairs and cups cost about $70. Coffee is another $50. And food can rack up anywhere between $30-$50, depending on how fancy we get and how much we choose to make from scratch (which is usually most of it). We split bill down the middle, and I would say I usually end up spending about $100 - $150 per reading. If you can't afford that kind of money, then you might consider a cover charge or asking for donations to offset the cost of the event. It's really up to you and what you can afford to spare. 4. Readers. Obviously, you're going to need readers if you want to have a literary reading. For the first event at the studio, I reached out to writer friends that I knew and respected, and asked them if they wanted to read, or knew anyone else who would. I was able to find 10 readers pretty easily. While I sort of hand picked the first batch, since then I've had a clipboard at subsequent events and people sign-up to read. I try to keep things as fair as possible - if someone who has never signed up before asks to read, they're pretty much in. If someone has read before, it depends on how many new people we have, how much space is available, and how long ago they last read. There's no try-out or audition, and I don't ask to see examples of someone's work before I allow them to read. Sometimes this means the quality of readers can vary from performer to performer, and that's okay. I love the seasoned writers, the professors and the folks with publications, but part of me loves the first timers even more. Knowing someone has never read their own work in public before, knowing that I can give them the chance to jump that hurdle - it's kind of awesome, and I wouldn't want to keep that experience from anyone. 5. The order. Even though I don't know what folks are reading, I do try and find out if they're bringing poetry or prose, and how long their piece takes to read. I ask readers to keep it between 10-15 minutes long, though we've had cases where people have gone over. It's annoying, but it's not the end of the world. I also know most of the people who are signed up to read (one of the benefits of living in a small town) so I try and find a balance between the more and less experienced readers, and I try to make sure a first timer doesn't have to follow, say, the most popular professor on campus. I've also found that for our events, eight readers is ideal number - four in the first half, a brief intermission (about 15 minutes) and then the final four. Some of the audience always leaves during intermission, so if I know someone read in the second half four months ago, I try and put them in the first half the next time they read. I'm not sure anyone knows how closely I pay attention to these things, or if they appreciate my attention, but there it is. 6. Promotion. I'll admit it. I'm a lazy promoter. I make a Facebook event for the reading (though the yoga studios' Facebook page) and I watch as the readers, their friends, and event supporters repost it and share it in the weeks and days leading up to the event. We've had articles about the reading in both the local paper and in the college newspaper, which has been nice. Sometimes I get a little flyer made up, and stick it in the coffee shop or in SFA's English department, but mostly I rely on Facebook and word-of-mouth. Because I live in a college town, and because both the studio and the writers are tight-knit groups, we get between 40-70 people at every event. Not too shabby for a little town in East Texas. 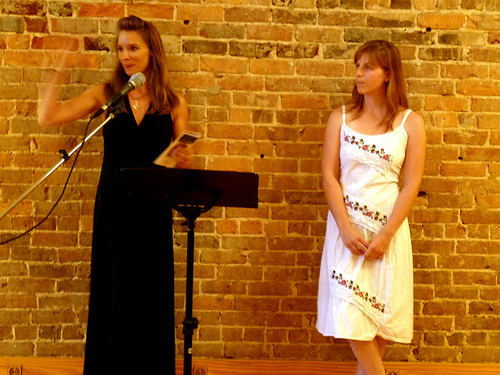 This is from our first ever reading in August of 2009. We both had such long hair then! 8. Post-reading. After the reading is over, pack up your chairs, clean up the food, and revel in your success. The following week, find time to send each reader a little thank you email, for their time and talents. (I am good about this maybe half the time - oops!) Make sure you don't lose the sign-up sheet for next time. And don't forget to post the photos to Facebook so everyone can see what an awesome time you all had. And then you get to rest for a few weeks, until it's time for the next reading! Questions? Comments? Anything I've missed? Feel free to let me know!